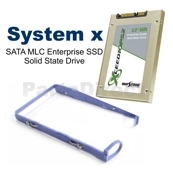 The IBM® SATA 1.8-inch and 2.5-inch MLC Enterprise solid-state drives (SSDs) for IBM System x® employ enterprise MLC NAND technology to bring an affordable, but performance-driven solution for applications requiring enterprise workloads with a mix of read-write operations. These industry standard 1.8-inch and 2.5-inch form factor SSD drives use a single-chip controller with a SATA interface on the system side and n-channels of NAND flash internally. They are targeted at databases and other enterprise workloads that require high I/O performance in random read and write operations including applications caching and tiering. The 1.8-inch SSDs can also be configured into the IBM eXFlash solution for maximum capacity and performance.